One could argue that, as an image editor, Adobe Photoshop is in a class by itself — a unique industry standard. So perhaps it’s counterintuitive to suggest alternatives or replacements for it. Still, some people who bought Photoshop in the past did so because it was the best image editing app, even if it had high-end features they knew they would never need. But, the industry has changed. 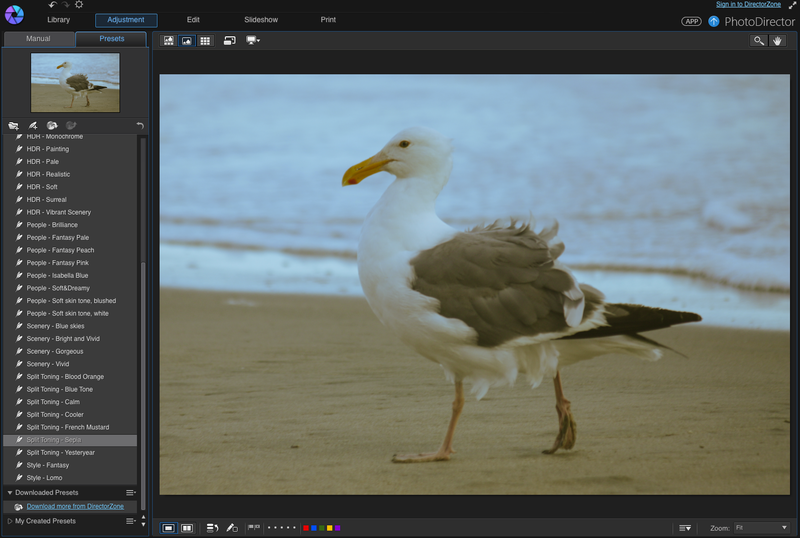 Instead of just being one piece of software among many, Photoshop is now the linchpin of Adobe’s Creative Cloud service, and for the past couple of years, it’s been available only by subscription. Adobe’s subscription strategy is separating the pros who need it for work from the hobbyists seeking the best help money can buy. Adobe is accommodating pro shooters with its Photography Program for $9.99 per month, which includes sweeteners like Lightroom, Mix and cloud-based sharing, storage and syncing extras. But what if Photoshop is overkill for your purposes today, or a subscription model is unappealing? Several new apps — and updates to existing ones — have emerged that may be even better suited to your needs. We poked around and found 10 good prospects spanning Mac, Windows and Linux platforms, and suitable for amateurs and enthusiasts seeking a Photoshop alternative. We stuck to the desktop apps only because it much of serious image editing still takes place on the desktop. Affinity Photo, a brand new app from Serif, has just emerged from an open beta as the closest pro-level Photoshop challenger yet. Not only does it works with Raw files, unlike most photo editors, it offers CMYK (four-color separation) alongside support for most popular photo formats, including PSD. You can pan and zoom at 60fps using the app’s live previews, even when working on huge images with many layers. I found Affinity Photo very easy to learn and use. Performance is stellar, especially for a new product, and it has many familiar Photoshop tools and adjustments in a brightly colored toolbar that reminds me of Pixelmator — which is a good thing. You also get a host of filters including lighting, blurs, distortions, tilt-shift, shadows, glows and more. Users get full control over every aspect of a filter’s properties, complete with real-time previews. Filters can be applied as layers, letting you edit effects after they have been applied. The downside? It’s for the Mac only. 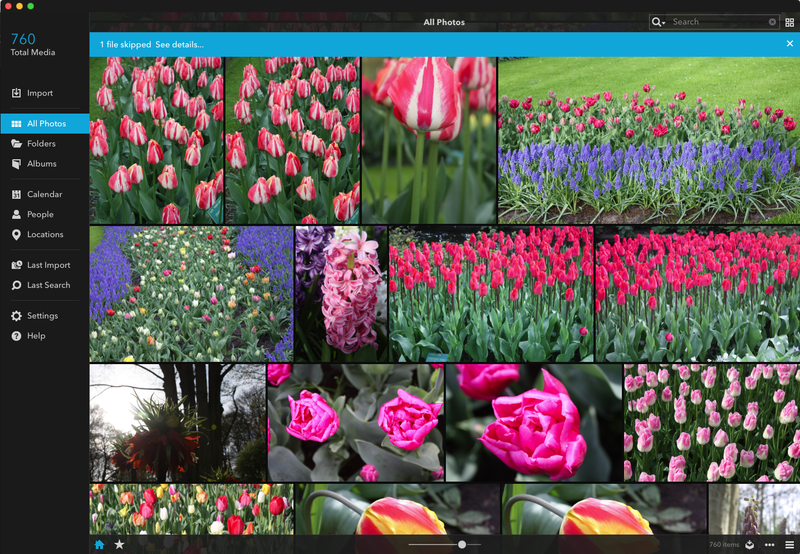 Mylio, another newcomer, was launched recently for Windows and Mac, plus both mobile platforms, to manage and sync your photo collections. The app automatically copies and syncs all of your photos, edits and changes to all of your devices. Mylio builds on your existing albums and file and folder structures, and maintains them from Lightroom, Aperture and Facebook in an intuitive and attractive interface. 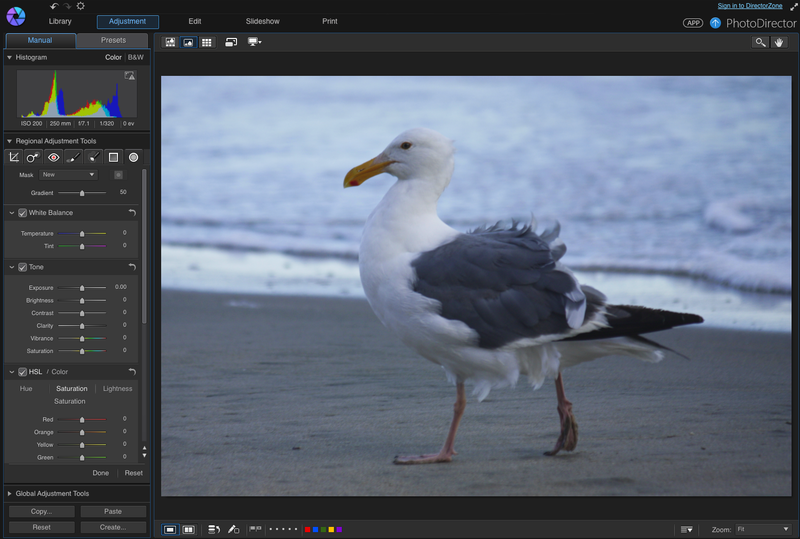 Mylio is lighter on editing facility than photo management, but it does provide for common fixes most photographers need. Regardless of which edits you make to your photos, changes will appear across all your devices. For all that organizing and syncing, there is a subscription fee. After the first month free, the fee ranges between $4.17 and $20.84 per month for a choice of three plans covering three to 12 devices and 50,000 to 500,000 photos. Adobe Photoshop Elements is essentially Photoshop Lite — the consumer version of the granddaddy of image editors. Elements borrows heavily from Photoshop in terms of core image editing functionality, but its interface differs vastly — it’s much more accessible, with a bright, friendly consumer feel. Taking into account the skill disparities among hobbyists, Elements offers three levels of editing functionality: Quick, Guided and Expert editing tabs give you as much heavy lifting as you wish to handle. 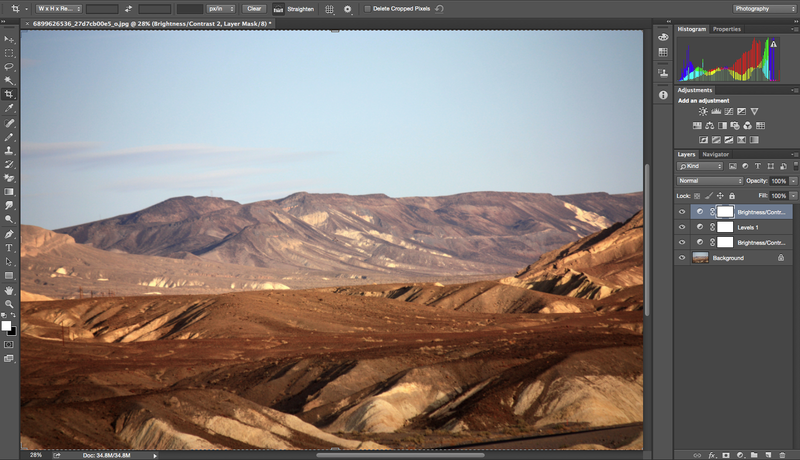 For the enthusiast set, some of Photoshop Elements’ new features like Photomerge Compose and the Refine Selection brush may require a steady hand. The newest version supports also supports High DPI on Windows and Retina Displays on Macs. Adobe’s Lightroom photo manager was basically considered a direct competitor to Apple’s Aperture until the latter was discontinued. 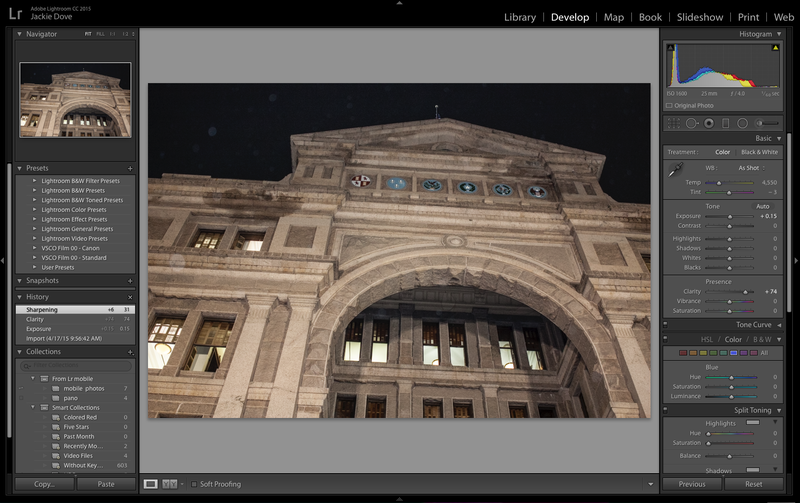 Lightroom is more of a photo manager than its sibling, Photoshop, but even so, it has a huge variety of image editing features that will likely satisfy most hobbyists. Lightroom is easier to use and learn than Photoshop and it also has a companion mobile version. 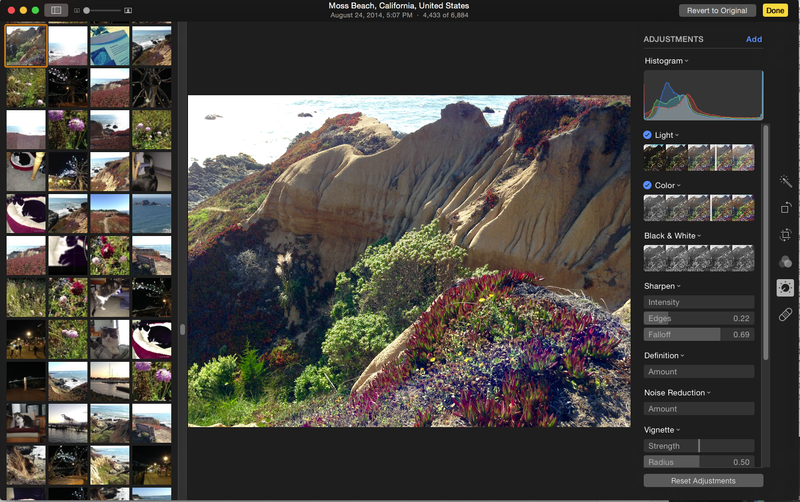 And, significantly, Lightroom is one of the few pro-level creative apps that Adobe still sells as a perpetual license. It’s also available as part of the Creative Cloud Photography plan, which includes Photoshop, Photoshop Mix, mobile apps and cloud storage. 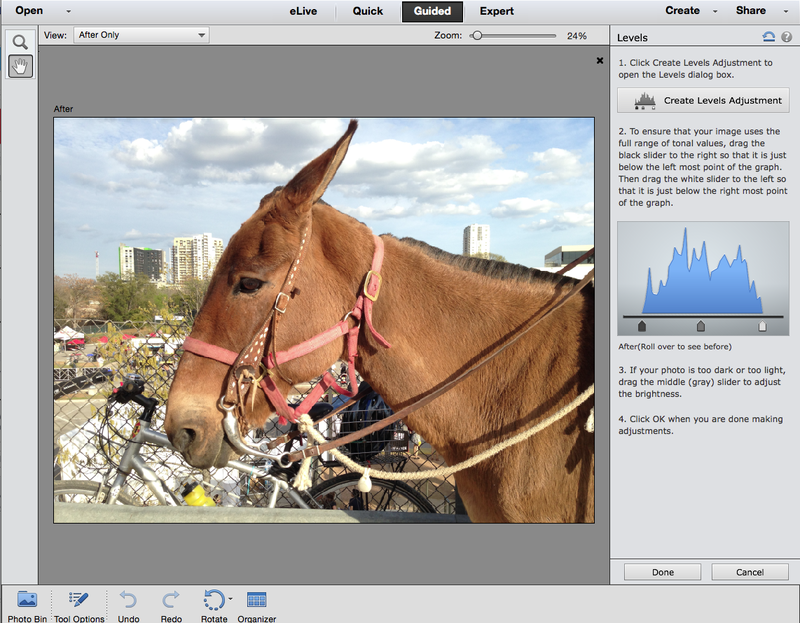 Apple Photos is the free Photoshop alternative for Mac. It replaced iPhoto and Aperture on the Mac desktop, providing full-featured organizational tools as well as consumer-level editing capabilities. Photos substitutes for iPhoto fairly nicely and integrates with your iCloud account to share photos across all your platforms. Photos’ organization will look familiar if you use Photos for iOS. You will recognize Moments, Collections and Years views for organizing, while a toolbar lets you tap into your shared photos, albums and projects. Photos does have more advanced editing tools than iPhoto, though, in addition to a completely reorganized toolbar that gives you Aperture-style tools in an elegant layout. 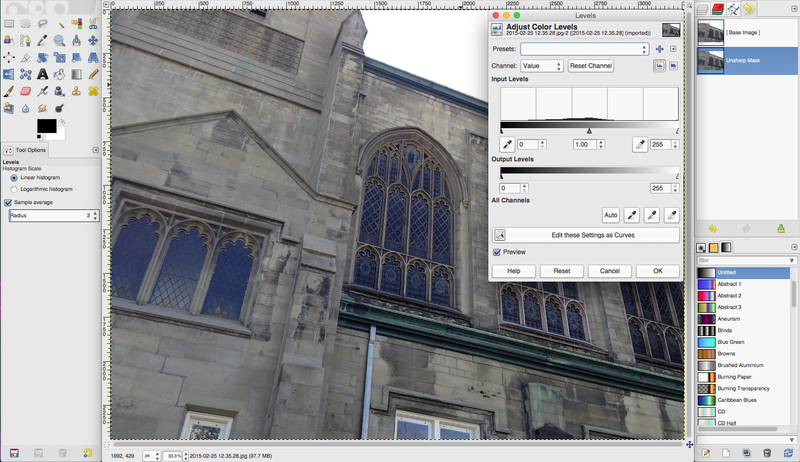 Controls include Light, Color, Black & White, Levels, White Balance, Definition, Vignette and Revert. 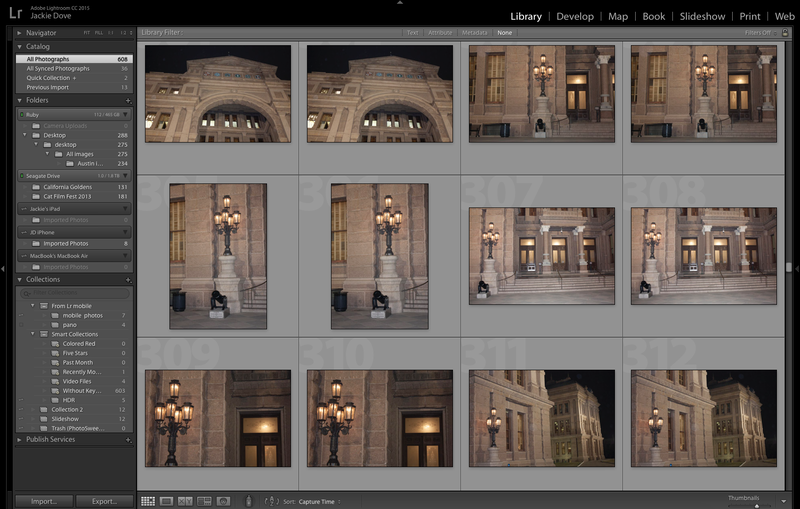 While Photos does dive into some intricate edits, most of the professional functions of Aperture are gone. The emphasis is on iCloud integration, light edits and easy sharing. 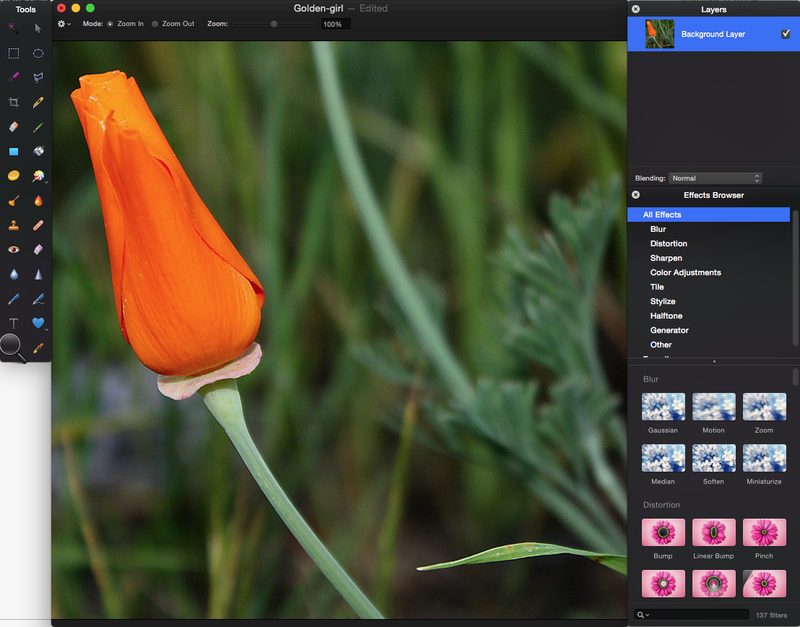 At launch, Pixelmator became an instant favorite of the Mac community. The current version includes support for recent Apple technologies, including integration with the new Photos app, Force Touch trackpad and more. Now, you can access your Photos library right from Pixelmator’s photo browser, paint with pressure sensitivity on the new MacBook and MacBook Pro and remove unwanted elements from your photos up to five times faster with the enhanced Repair tool. The context-sensitive Move Tool lets you move, rotate and distort elements, selections, text, shapes or layers. When you move the layers, smart Alignment Guides appear, letting you neatly align and distribute objects. Let’s not forget Pixelmator’s excellent vector tools that are great for logos, posters, Web layouts and custom shapes. GIMP (GNU Image Manipulation Program) is a free, open source semi-replica of Photoshop. This pro-level app is free and lets you accomplish much of what you can in Photoshop. While the interface is improving over time, is not nearly as elegant or intuitive. 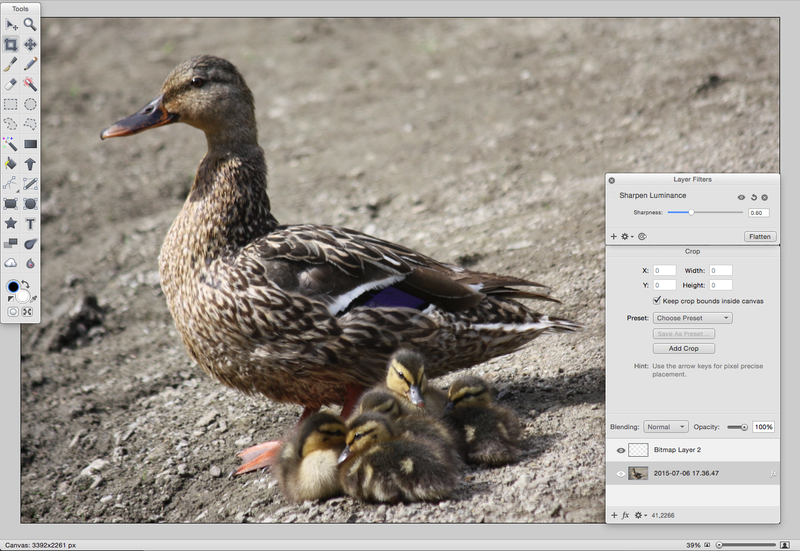 GIMP was created for the benefit of folks in GNU/Linux and UNIX community who need image manipulation software. The app lets you fix perspective distortion caused by lens tilt, eliminate lens barrel distortion and vignetting with a filter, get rid of unneeded details with the clone tool or touch up minor details with the healing tool. 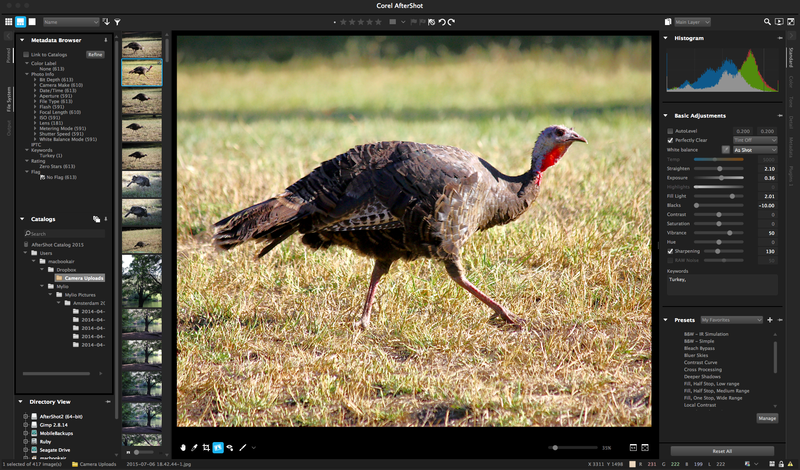 When photographers think about photo management, Adobe’s Photoshop Lightroom may spring to mind, but consider Corel’s AfterShot Pro. The app is designed with 64-bit performance to act as a Raw converter, non-destructive photo editor and photo manager. 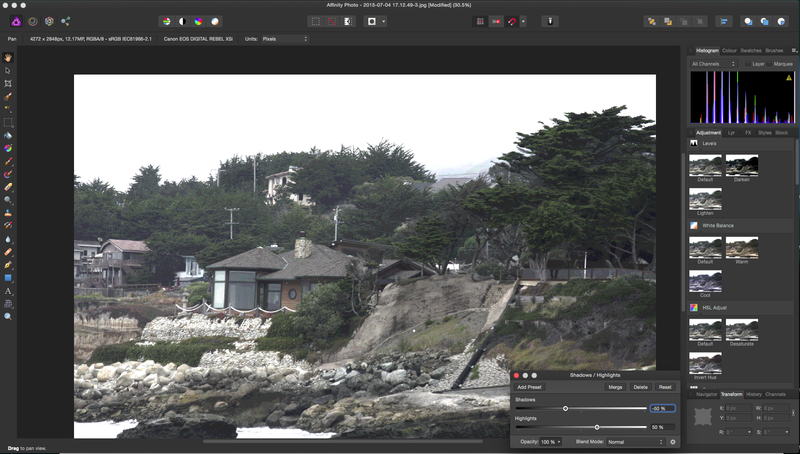 The most recent AfterShot Pro version has an updated interface with an enhanced zoom offering better previewing of smaller images. A new Image Reset button lets you revert to your original photo in one click, even after a series of edits. 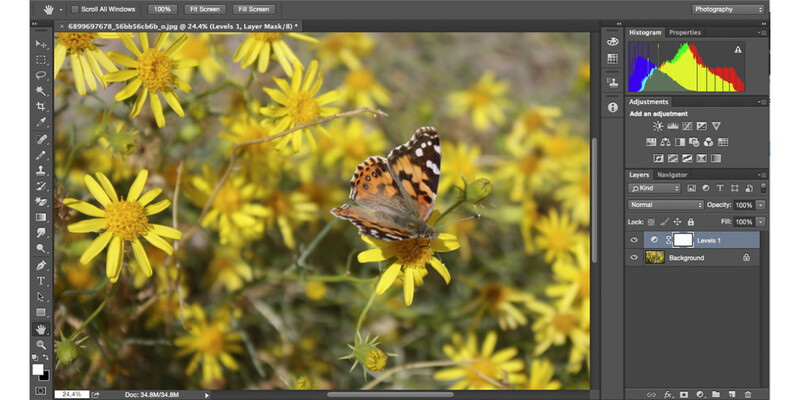 Editing tools span the range from Smart Photo Fix, White Balance, Brightness/Contrast, Fill Light/Clarity, Local Tone Mapping, High Pass Sharpening, and Digital Noise Removal. The app’s HDR features let photographers combine multiple exposures to create a single photo. Flying Meat’s Acorn has been a perennial favorite for years among folks who have a bit of image editing to do for work or personal photos and can manage to organize their photo collection on their own. The newest version of Acorn has better performance than its predecessor and, like Photoshop, Elements and others, it features layer styles and non-destructive filters, curves and levels, working non-destructively with layers and layer masks. 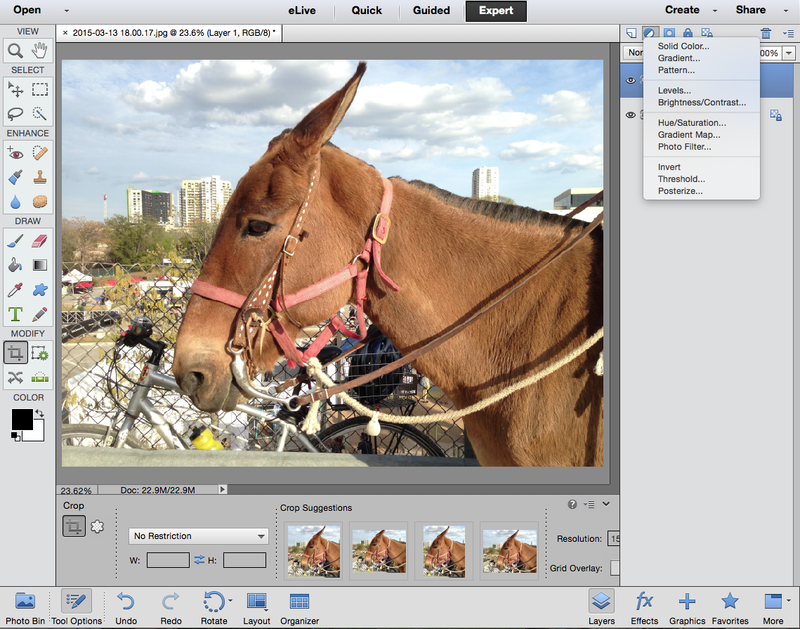 CyberLink Photo Director — like Adobe’s Photoshop,Photoshop Elements and Apple’s iPhoto — concentrates on image editing, with some management tools thrown in. PhotoDirector is CyberLink’s only choice for Mac users. Version 6 offers an assortment of new features, including a radial and gradient adjustment mask and improved toning for better detail and contrast. Film-like grain effects presets, a photo merge feature for panoramas with content-aware fill and face swaps for group portraits, and improved skin tone, body shaper, and collage features. 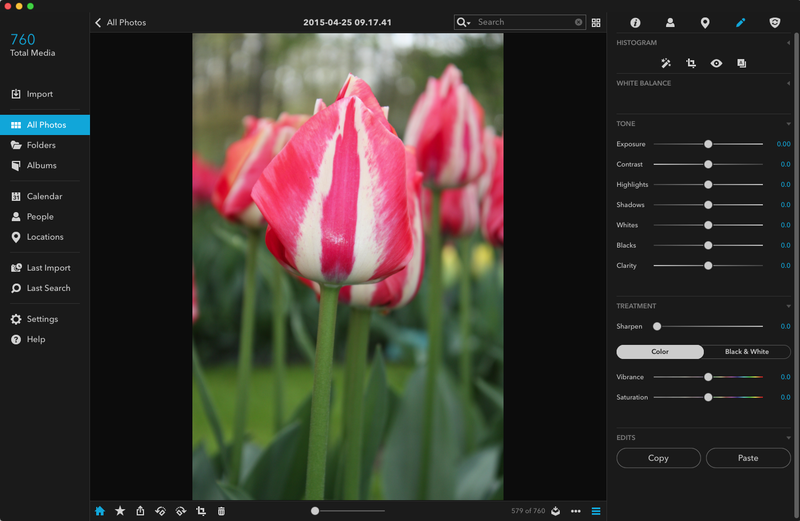 The most recent version supports 54 new camera Raw profiles, 36 new lens profiles for auto correction, Open CL support for swifter exporting of edited photos, a share via email or social media feature and the ability to edit EXIF timestamps. PhotoDirector also has free mobile editions for Android and Windows 8 devices. Each of the above packages are excellent for specific target audiences. It’s up to you to try them and figure out which one is the best for you. Luckily, all of them offer free trials and tutorials to get you up to speed quickly. Four are Mac-only with all the others cross-platform. Did we miss any apps you like? Let us know in the comments.